Around the world there are a myriad of NGOs using human rights education (HRE) as a tool of community empowerment with the firm belief that it will help people improve their lives. One way of understanding these processes is that they translate universal human rights speak using messages and symbols which make them relevant to people’s daily lives and culturally resonant. However, an alternative more radical perspective is that these processes should engage individuals in modes of critical inquiry into the ways that that existing power structures maintain the status quo and control not only how we understand and speak about social inequality and injustice, but also act on it. This book is a critical inquiry into the production, distribution and consumption of HRE and how the discourse is constructed historically, socially and politically through global institutions and local NGO practice. 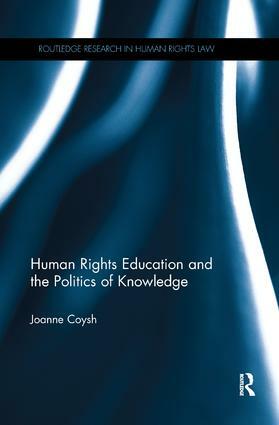 The book begins with the premise that HRE is composed of theories of human rights and education, both of which are complex and multifaceted. However, the book demonstrates how over time a dominant discourse of HRE, constructed by the United Nations institutional framework, has come to prominence and the ways it is reproduced and reinforced through the practice of intermediary NGOs engaged in HRE activities with community groups. Drawing on socio-legal scholarship it offers a new theoretical and political framework for addressing how human rights, pedagogy, knowledge and power can be analysed between the global and local by connecting the critical, but well-trodden, theories of human rights to insights on critical pedagogy. It uses critical discourse analysis and ethnographic research to investigate the practice of NGOs engaged in HRE using contextual evidence and findings from fieldwork with NGOs and communities in Tanzania.